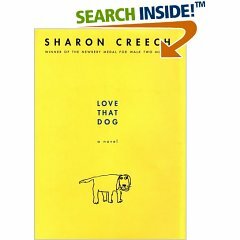 I picked up Sharon Creech’s Love That Dog because I absolutely loved her novel Walk Two Moons , which won the Newbery Medal in 1995. A la Creech’s Heartbeat and Karen Hesse’s Out of the Dust , Love That Dog is a realistic fiction novel written in free verse. But Love That Dog isn’t just for people who like poetry; Love That Dog is also for people who think they don’t like poetry–like the novel’s protagonist, Jack. Although Love That Dog is written in free verse, it’s almost a dialogue (a la Beverly Cleary’s Dear Mr. Henshaw ) between Jack and his teacher, Miss Stretchberry, though the reader must infer Miss Stretchberry’s thoughts based on Jack’s poems. (If you’ve ever listened to one end of a phone conversation and been able to figure out what the person on the other end was saying, you shouldn’t have any trouble following this novel’s plot.) Despite his preconceived notion that “boys don’t write poetry / Girls do”, over the course of one school year, Jack learns that boys do indeed write poetry–and that they can be very good at it. Through poetry, Jack finds his voice, a voice he uses to share his thoughts about life, love (between father and son and of the a-boy-and-his-dog variety), and loss. Love That Dog was a poignant reminder that each of us has a story within us and that each of us has the ability to tell that story through poetry. So pick up Love That Dog (or any of Creech’s other novels). You won’t be disappointed!